Difference between revisions of "Coast Live Oaks"
To the California Indians of the San Francisco peninsula, the coast live oak was more than a symbol. It was perhaps the single most important plant species to the indigenous peoples of San Francisco. They ate acorns, created bowls and utensils from the wood, and started fires with the bark and wood. Medicinal remedies were prepared from oak bark and leaves (Bocek 1984). 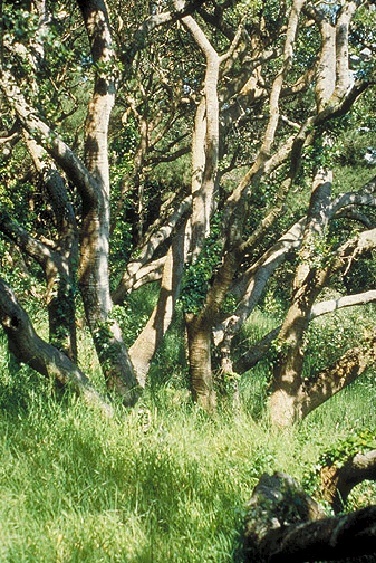 Countless other organisms are equally dependent on coast live oak woodlands, which harbor more wildlife than any other terrestrial plant community in this region. Coast live oaks are host to more species of small moths, for example, than any other species on the San Francisco peninsula (De Benedictis et al. 1990). These moths and the many other invertebrates found on a coast live oak feed a wide variety of birds, including Huttons vireo, which is virtually dependent on the oak--it has been described as the spirit of the live oak tree (Davis 1995). This songbird about the size of your palm--not much bigger than a hummingbird--flits methodically around the oak canopy snapping up caterpillars, weevils, and countless other insects. Its hanging nests, woven from lichens, leaves, and strips of bark and held together with spider silk, have been found in the Presidio's oak woodlands. Its numbers have dramatically declined throughout San Francisco and the Bay Area as oak woodlands have been destroyed by development. Its decline on the Presidio may have begun as early as the late 18th century when the first Europeans arrived and began cutting its oak woodlands to supply firewood for a growing population. Coast Live Oak in the Presidio, mid-1990s. Not far from the edge of a landfill on the Presidio are a few precious Quercus agrifolia ( coast live oaks), potent symbols of life and renewal. When the winter rains come, new leaves emerge and catkins release their pollen to the wind. Later, as spring nears, endosperm fills the bulging acorns. The hummingbirds come then, too, and engage in dazzling courtship displays for each other, building nests in the oaks as early as February. 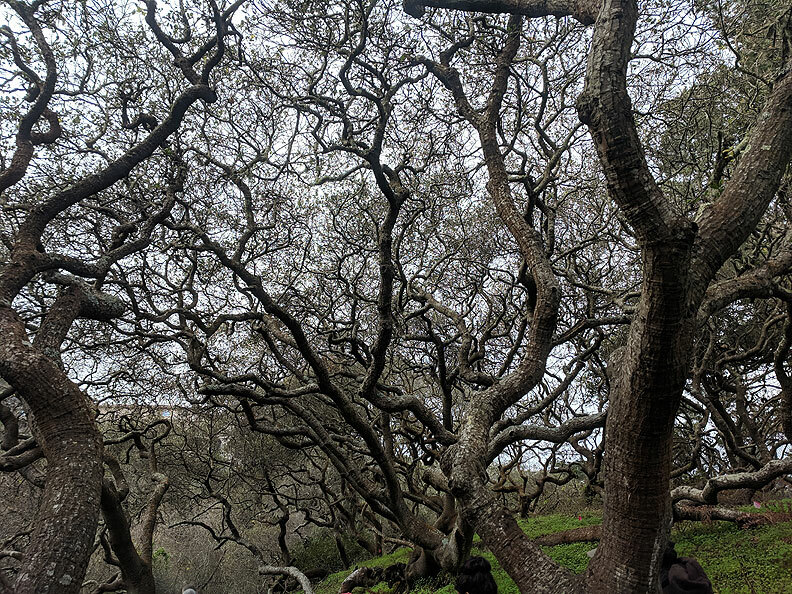 Coast Live Oaks along Lobos Creek, January 2019. To these Europeans, the oaks were almost an afterthought. On a spring day in 1776 one of the first Europeans to see this land worried more about the lack of tall trees for timber. There is not a tree on all those hills, Father Pedro Font wrote, though the oaks and other trees along the road are not very far away (Bolton 1931). Like the California Indians they displaced, the Spanish and mestizo (people of mixed Spanish/Indian descent from Mexico) soldiers depended on the surrounding land for food, clean water, and shelter. They brought cattle to graze the grasslands, cleared other areas for vegetable gardens, and harvested firewood from the oak groves.